SuperCoils are a heavy duty replacement coil spring that fits most full-size trucks. Custom fit for each application. With a higher weight rating than the factory they are great for vehicles with snow plows, heavy duty front bumpers or a aftermarket winch! At Suspension Connection we offer the best prices on SuperCoils by SuperSpring along with free shipping when shipped in the continental United States. SuperCoils are heavy duty replacement coil springs designed to fit full-size trucks and RVs. Most SuperCoil applications are designed to replace the front coil springs. These coils are rated higher than the factory coil springs, with many applications available in heavy duty or extra heavy duty configurations. If you own a vehicle using a snow plow, front winch or aftermarket front bumper chances are you could use at set of SuperCoils. Designed specifically for the new Dodge Ram 1500 models. These HD coil springs give Dodge owners another option to beef up the level towing and hauling capacity of there vehicles. 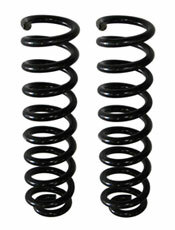 Simply replace the old factory coil springs with the new and get a 30 percent increase in capacity.